Bruce Christian is vice chairman of N.B. Handy Company, a wholesale distribution company headquartered in Lynchburg, Virginia. 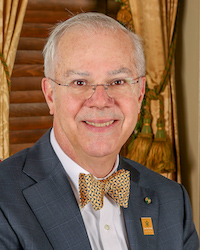 In June 2014, he stepped down after also serving as executive director of the Old City Cemetery, Museums, and Arboretum in Lynchburg for seven years. Christian completed his graduate work at Tulane University. He established the Christian-Ewell Scholarship at William & Mary for summer study in Latin America and the Christian Family Endowment at Swem Library for acquisition of non-English materials on Latin America. Christian is a member of the Chancellor’s Circle, served as a trustee of the William & Mary Foundation, was a member of the National Campaign Committee for the Campaign for William & Mary, completed two terms with Swem Library’s Board and is currently a member of the Alumni Association board. Bruce is a member of the Planning Steering Committee and Leading Liberal Arts University subcommittee of the strategic plan. He was a recipient of the Alumni Medallion in 2013. He lives in Lynchburg with his wife Spas. They have three children.